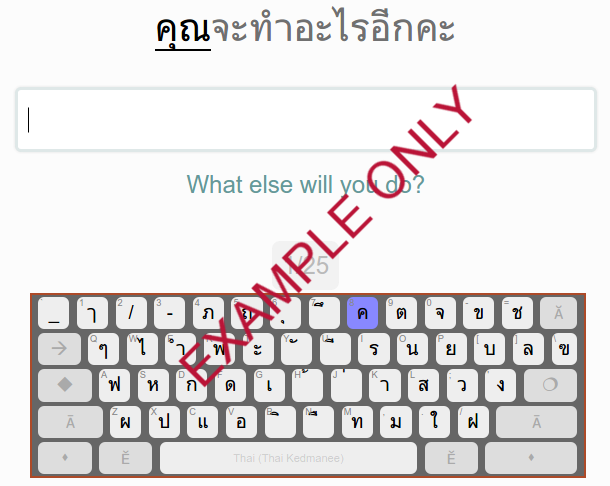 We are pleased to announce that Learn Thai Ping now incorporates an optional on-screen Thai keyboard. The on-screen keyboard highlights the next key location to help you find your way around the Thai keyboard really fast. When using the Thai on-screen keyboard all input is converted to Thai, so you can type in Thai straight away even if you don't have a Thai keyboard / stickers! Only available on desktop browsers. We just couldn't fit it onto the screen for mobiles.